I love duvets. They are fantastic to sleep with. However, my oldest son is a crazy sleeper (I am told he takes after me when I was younger). He is upside down, sideways, kicking, all night long. Duvets do not work well with this type of sleep behaviour. The blanket balls up inside the cover and it is hard to keep warm at night. I tossed a lot of ideas around before deciding that he would be the recipient of a blanket made by me. 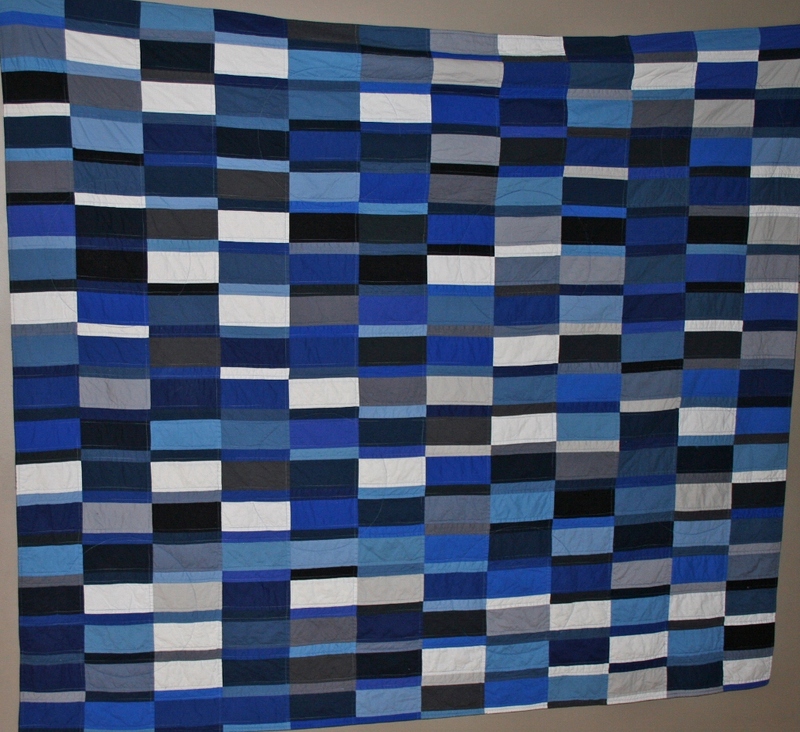 The blanket turned out to be a Plain Spoken quilt. I couldn't resist. My son loved the idea too. We picked the pattern (Plain Spoken) and the fabric (Kona Cotton Solids in Denim) in the summer. He is a very patient boy. He took it in stride when his quilt was trumped by one for my Auntie. He waited patiently while I worked on Halloween Costumes. He waited patiently while I worked on Christmas. Then I made him a promise. I promised him it would be done before his February Birthday. One week before his Birthday he was happy to remind me that I made him a promise. 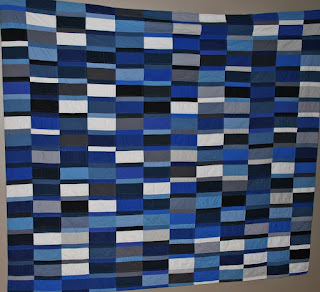 I am happy to say I was able to keep my promise and deliver his quilt before his Birthday. I chose to do a fleece back for the quilt, nice and cozy. 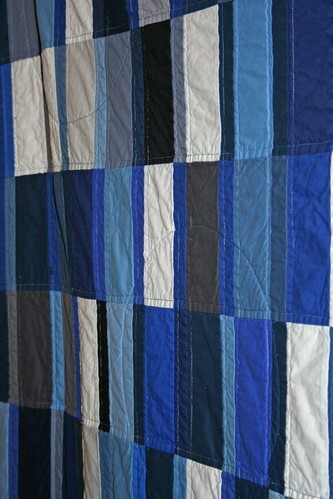 I didn't want all the quilting to be on the back of the quilt though. 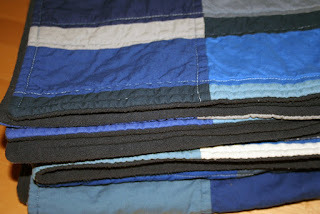 So I read a little bit about quilting without a back and chose to do that. I stitched 1/4 inch from the seams with straight line quilting. Then I added the back and quilted it in place with large circles. I like how it turned out. The other choice I made was to not use binding. 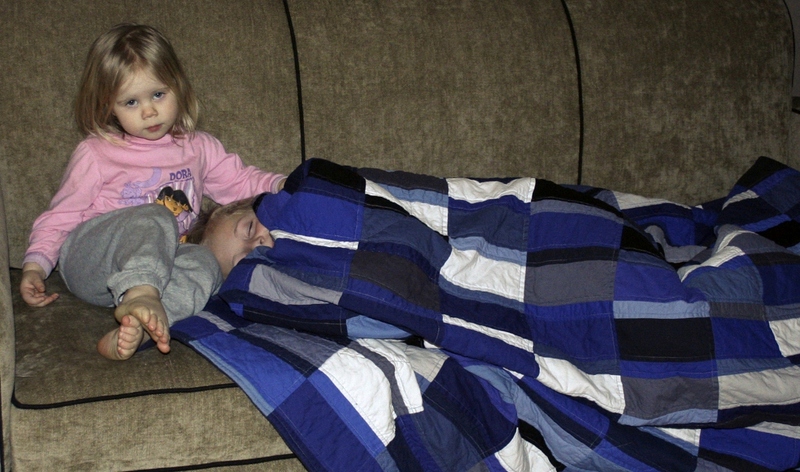 Finally, what does a boy do when he gets his new blanket? 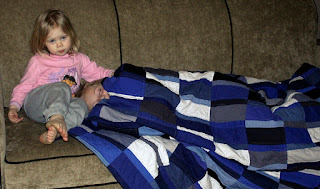 Cuddles on the couch with his baby sister.